Our rivers are wonderful resources and should be enjoyed but they can be dangerous. This page has been developed to give paddlers and boaters basic information about river hazards and provide safety measures. Even with all we know the most important thing that we can all use to be safe on the rivers is COMMON SENSE. Foot entrapment - Catching a foot in rocks on the bottom of the river. May be caused by trying to stand up while getting swept downstream in water mid-thigh to mid-torso deep. Strainers - Trees or single branches in the current, with river water flowing through, can cause a severe pinning hazard. Strainers many be caused by erosion. Trees can also fall because of old age, floods, and storms. Look for them on wooded riverbanks, along small creeks after high water, often found on the outside of bend, and on less utilized rivers. Always look downstream to spot bobbing twigs or irregular flow patterns. Man Made Entrapments - Manmade objects in the river are inherently more dangerous than most things natural. Keep an eye out for bridge pilings, low head dams, junked cars, any man made object found commonly in urban rivers, highway crossings, and abandoned dam sites. Make it a habit to visually scan downstream. Broaches - Getting pinned on a rock, either amidship or at the ends. Avoid sharp rocks that can potentially crease a boat or serve as point to be wrapped by your kayak! Develop the instinct to lean into the rock with your boat and body leaning together. Undercut Rocks - Undercuts are water features where a slab of rock, or rock shape, forces the current flow to go under the surface. Learn to spot them by the dark shadow on the upstream side of the rock, the lack of pillowing action by oncoming water, and by the lack of a predictable eddy on the downstream side. Most dangerous undercuts are well known by locals, and listed in guidebooks. Entanglement - Getting tangled exiting your boat is most likely to be caused by ropes, and loose lines, in your boat. Practice wet exits and critically evaluate your outfitting for entanglement potential. Treat throw ropes as potential hazards. Keep them neatly bagged, and carry a knife for rescue. Vertical Pins - When the bow buries and gets pinned on the bottom after a steep drop. This is not a concern until you are paddling drops of over 3 or 4 feet. Advanced paddlers prevent them by checking the water depth first, and leaning back and performing a 'boof' move to keep the bow up. Paddling boats with a large volume bow reduces this risk substantially. Dams are built to back up water in a reservoir for a variety of reasons. Dams are hazardous both above and below the dam. These wall-like structures pool the water as it flows over the crest and drops to the lower level. Be honest with yourself when evaluating your skills (and skills of others in your party). You will have a safer and more enjoyable trip if you choose sections of the river that match your ability. Check on current water levels before embarking on your trip. The difficulty level of certain sections of river can change dramatically with changes in water level. Gentle stretches can become dangerous with high water levels. At extremely low levels, you may find yourself paddling through puddles, dragging the canoe over rocks, or portaging. 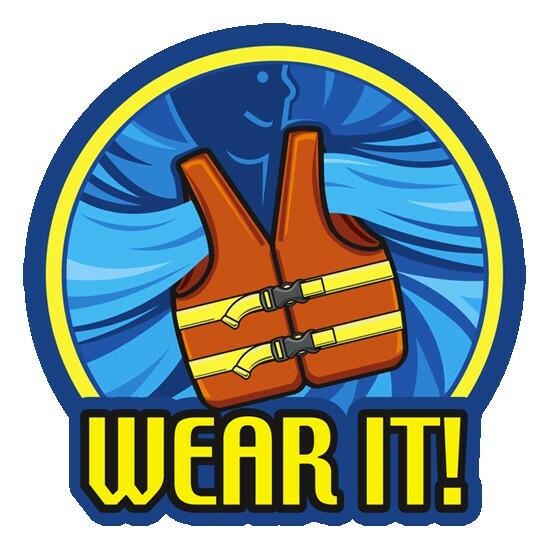 Wear a U.S. Coast Guard approved life jacket at all times. Even gentle stretches of water can have wicked undercurrents. Even good swimmers need to wear one. Scout rapids and make rescue plans if needed. Be aware that on some sections of these rivers, land access may be difficult and help is far away. BE AWARE OF THE CURRENTS IN THE WATER – you don’t want to end up floating farther downstream than you planned. If the current starts to pull you along faster or you see lots of rocks in the water ahead of you paddle away from them or paddle towards the shore. AVOID LETTING BIG WAVES HIT THE SIDE OF YOUR CANOE – always try to keep your canoe at a right angle to the waves otherwise the wave might push your canoe over. TIE ALL YOUR EQUIPMENT TO THE CANOE – put your equipment into a waterproof bag to keep it dry and tie it to one of the center beams in the canoe so that you don’t lose everything if your canoe tips over. Make sure that your water skills and experience is equal to the river and the conditions. Never boat alone. Always have at least one (preferably two) other boats with you on a river trip. Know your limits of swimmers rescue and self-rescue on rivers. Know when and how to swim for the eddy. Reduce injuries by wearing protective footwear and proper clothing designed for river recreation. Plan your trip and stick to your plan. Stay away from the river during high water. Be prepared for extremes in weather, especially cold. Know about the dangers of hypothermia and how to deal with it. Know early signs and symptoms of heat exhaustion and dehydration in hot weather. Carry a first aid kit and know how to use it. Learn or review medical aid responsibilities and CPR. Watch out for new snags after winter and spring floods. When in doubt, stop and scout. If you are still in doubt? Portage. Avoid overexertion and guard against extreme weather conditions. File a "float plan" with a reliable person indicating where you are going and when you will leave and return. Remember to contact the person once you have returned safely. Do not overload or unevenly load your craft. Do not attempt to stand or walk in swift moving water. Most boating fatalities don't have anything to do with bad weather or hazardous sea conditions. They typically occur in smaller, open boats on inland waters during daylight hours when weather and visibility are good, the winds are light, and the water is calm. Despite these ideal conditions, passengers fall overboard and many boats capsize, causing over half of all boating fatalities. 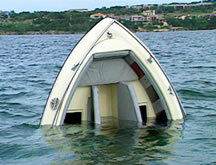 Capsizing is when a boat turns on its side or turns completely over. Swamping occurs when a boat stays upright and fills with water. Sometimes a person falling overboard from a boat causes the boat to capsize or swamp. Regardless, the outcome is the same—people are in the water unexpectedly. To help prevent and prepare for capsizing, swamping, or someone falling overboard, follow these guidelines. Make sure that you and your passengers are wearing life jackets while the boat is underway. Attach the ignition safety switch lanyard to your wrist, clothes, or life jacket. Don't allow anyone to sit on the gunwale, bow, seat backs, motor cover, or any other area not designed for seating. Also, don't let anyone sit on pedestal seats when operating at a speed greater than idle speed. Don't overload your boat. Balance the load of all passengers and gear. Keep your center of gravity low by not allowing people to stand up or move around while underway, especially in smaller, less-stable boats. In a small boat, don't allow anyone to lean a shoulder beyond the gunwale. Slow your boat appropriately when turning. Don't risk boating in rough water conditions or in bad weather. When anchoring, secure the anchor line to the bow, never to the stern. Sitting on the gunwale, bow, seat backs, or any other area not designed for seating is risky behavior and can result in falling overboard. It is illegal in many states. Attach 7-8 feet of galvanized chain to the anchor. The chain aids in setting the anchor by lowering the angle of the pull as the chain sinks and lies on the bottom. It also will help prevent abrasion of the anchor line from sand or rock on the bottom. Most anchors grip by digging into the bottom when the line is pulled horizontally. Any upward pull may break the anchor loose. Be aware that the boat will swing downwind or down current from the anchor. Allow "swing room" for any change in wind or current! Make sure that your watercraft is in good condition. Keep motor tuned. Water is hard on wiring and any electronics is subject to corrosion. Make sure that any corrosion is cleaned and coated. Take extra tools with you. 50% of all boating accidents are alcohol related. Drinking while operating a watercraft may not be illegal in some states, but it is stupid in all of them! Always have an alternate method of propulsion. In canoes and kayaks that means an extra paddle. In powerboats it is an oar. This is important if the motor quits and it is the law in most states. Carry the correct fire extinguisher, first aid kit, water bailer and it is very important to carry the correct size anchor with a line attached so that it can be used quickly in an emergency. Some type of communication device is important in the event of an emergency. If you are not carrying a marine radio, a cell phone will often work. Never overload a boat. Most watercraft have a U.S. Coast Guard maximum load rating plate. Heavy objects such as coolers, water and fuel should be considered along with the number of persons allowed in the rating. There is no substitute for experience. If you are new to boating (especially on rivers and off-shore) take and experienced person with you. Write up a float plan and leave it with a responsible person. Check in from time to time. This can provide valuable information in the event of a search. Click Here to get a printable float plan form by the U.S. Power Squadron. Check the weather conditions before going out and be prepared for bad weather. Take rain gear and a bailing bucket. With boats equipped with bilge pumps, make certain that they are in good working order before setting out. The photo of below show a great program sponsored by the U.S. Army Corp of Engineers along the Cumberland River. "Kids Don't Float" is the message at the loaner life jacket station. Here's a little known fact. 90% (unconfirmed statistic) of men found drowned from falling overboard while fishing are found with their fly open. If you don't want to go below to use a head or porta potti or don't have such creature comforts then get a small plastic pot. Don't stand out by the rail or near the edge of a boat. Its a lot easier to lose your balance than you think.